Electric vehicles, lighter-weight aircraft, and enhanced materials processing are themes worth investing in. Advanced materials are loosely defined as those designed with enhanced properties that improve on traditionally used materials. A broader definition includes materials seeing increased demand due to advanced technologies. For example, if you want to reduce the weight of aircraft (while also increasing strength) then Hexcel Corp. (NYSE:HXL) advanced composites are going to come in handy. Similarly, if you believe in the future of electric vehicles, then the lithium produced by Albemarle Corp. (NYSE:ALB) (used in batteries) will surely come into high demand in the future. If you want to invest in companies that provide technology to materials processors, then high-performance laser manufacturer IPG Photonics Corp. (NASDAQ:IPGP) is well worth a look. Here are the investment cases for all three. The growth of electric vehicle sales and demand for lithium in batteries is the key to Albemarle Corporation's growth prospects. Image source: Getty Images. The company's carbon fiber and advanced composites have high strength-to-weight ratios; by substituting them for conventional materials, aircraft manufacturers can reduce an aircraft's weight while also increasing its durability. As larger (wide-body) aircraft tend to weigh more, they tend to use relatively more advanced composites than smaller (narrow-body) aircraft. For example, more than 50% of the weight of the wide-body Airbus A350 XWB comes from composites, compared to just 10% to 15% of the narrow-body Airbus A320 NEO and Boeing 737 MAX. However, the sheer number of narrow-body aircraft on order means the combined value of the B737 and A320 program backlogs ($4.63 billion) to Hexcel is higher than that of, say the A350 ($3.4 billion). Moreover, newer generations of aircraft tend to be designed with higher proportions of carbon composites -- good news for Hexcel. Airlines' shift in preference toward newer generation aircraft, as well as the strong ongoing demand for narrow-body planes, will benefit composite suppliers. Meanwhile, the wide-body aircraft replacement cycle is expected to kick in at the start of the next decade -- many airlines appear to be waiting for the Boeing 777X to begin delivery. Those sales will mean big business for companies like Hexcel. In short, Hexcel's advanced material technology is a good way to play a secular theme (increasing use of lightweight materials) and a cyclical theme (increasing aircraft orders, and wide-body aircraft in particular). The specialty chemicals company is best known as the world's largest producer of lithium (the lithium business accounted for 49% of its adjusted EBITDA in the first quarter), which makes it an ideal play on the increasing demand for the element in electric vehicle batteries and consumer electronics. But Albemarle also produces bromine specialty chemicals (26%) used as flame-retardants and in other applications, and catalysts (25%) used primarily in petrochemical refining. EBITDA for the bromine specialties and catalysts businesses is expected to increase in the low-to-mid single digits in 2018, while lithium EBITDA is expected to rise by more than 20%. However, the key to the stock's prospects lies in the long-term demand for lithium to make EV car batteries. Management expects lithium demand from the transportation segment will experience a compound annual growth rate (CAGR) of 35% from 2017 through 2025, compared to a CAGR of 8% from the consumer electronics sector -- producing an overall 18% CAGR for the period that will see demand more than triple. The central assumption in this bullish outlook relates to the rate of adoption of EVs, and in particular battery electric vehicles (BEV). Albemarle's management expects BEVs to make up 6.7% of light vehicles sold in 2025. For reference, BEVs have no internal combustion engines, and therefore require significantly larger battery packs than hybrid (HEV) or plug-in hybrid (PHEV) vehicles. The mix of EV types being sold will be key, as Albemarle notes that BEVs have batteries 85 times the size of HEVs and four times the size of PHEVs, in terms of kWh per vehicle. As ever with commodity-type stocks, the balance of supply and demand will be critical, and some analysts fear that Albemarle and its peers are set to overproduce lithium, which would create a glut and send prices into a slump. However, it's difficult to predict with any precision where end demand will be over the long term. If you're optimistic about the growth trend for the electric vehicle market, then Albemarle is a good stock to buy. It's not an advanced materials company in itself, but IPG Photonics' fiber lasers are in demand by advanced materials processors. Fiber lasers are made of long optical fibers within which a beam is generated -- as opposed to traditional lasers, in which the beam is generated outside the system and directed into it using complex optics. A shift by manufacturers from non-laser technology to laser technology -- laser systems make up just 18% of machine tools worldwide, according to IPG. A transition among users from traditional lasers to fiber lasers, particularly in high-powered industrial end markets. It's a compelling case and helps explain the 16% CAGR the company experienced from 2012 through 2016. Last year, revenue grew at a whopping 40%, and it expects revenue growth in the mid-teens for the next few years. The company's quarterly bookings were the highest in its history in Q1, and it looks set for even better days ahead. All three stocks have exciting prospects that are somewhat reflected in their valuation multiples. Analyst forecasts have Albemarle and Hexcel growing EPS in the mid-13% range over the next couple of years with IPGP Photonics expected to grow at a slighter higher rate of mid-14%. 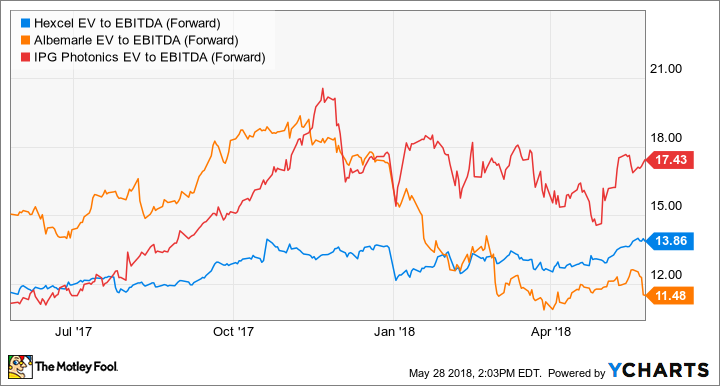 The valuations may look a little high right now, but (the price being equal) they will come down soon enough if all three companies meet their growth expectations. In other words, as long as the long-term growth story remains intact then these stocks have plenty of upside potential.